Harry Potter fanatics and Disney lovers around the world have been joyously expressing their delight that Emma Watson was cast to play Belle in Disney’s live-action production of Beauty and the Beast. Emma Watson perfectly depicted Hermione Granger in all of the eight Harry Potter movies, and she is sure to do the same as Belle in Beauty and the Beast. The similarities between Hermione and Belle got the MuggleNet staff thinking: What if Harry Potter characters had Disney counterparts? To begin the article series, the first paired characters are Hermione Granger and Belle to commemorate Emma Watson’s casting. However, their similarities run much deeper than the actress playing them. The list below explains why Hermione and Belle are perfect counterparts. 1) Both are intelligent young women who care about education. Hermione, the brightest witch of her age, can be seen vigorously studying for the OWL exams or taking an overload of classes at Hogwarts. She’s the perfect bookworm and prefers to use her knowledge from books and her impeccable logic to overcome an obstacle or solve a problem. Belle, like Hermione, is obsessed with literature and would rather be enjoying a book than participating in town gossip. Both Hermione and Belle’s bookish tendencies make the two characters quite unpopular among their peers. 2) Both are outspoken about their beliefs and values. Hermione is one who will defend the underdog. Because she is a Muggle-born, she has faced adversity in the wizarding world since she was first introduced. Hermione tends to stand up against bullies like Draco Malfoy and forms alliances with and befriends magical creatures, such as giants and house-elves. Belle also faces adversity in her village for standing out in the crowd and refusing to subject herself to the view of others. She isn’t afraid to overpower Gaston, and like Hermione, she willingly accepts creatures who are physically unlike herself, such as Beast, Lumière Cogsworth, Mrs. Potts, and Chip. 3) Both young women are exceptionally brave in the face of danger. Although Hermione seems to be the logical voice of reason in the trio, she is fiercely brave throughout her journey in the wizarding world. During her time at Hogwarts, she experienced such events as facing Fluffy and a troll, the Time-Turner, the near slaughter and rescue of Buckbeak and the rescue of Sirius Black, Dumbledore’s Army, the hunt for Horcruxes, and the ultimate Battle of Hogwarts. Belle is also a brave character, much like Hermione. In the beginning, her bravery is showcased when she voluntarily takes her father’s place who has been captured at Beast’s castle. From that moment on, she constantly displays her bravery as she enters into unknown territory with Beast and her newfound friends. 4) Both Hermione and Belle are pursued by men other than their soulmates. Belle is pursued by Gaston, a narcissist who believes his muscles are the most important foundation of any relationship. He, like Viktor, can’t truly comprehend Belle’s love for books. 5) Both fell in love with the unpopular choice. As the song in Beauty and the Beast says, Belle and Beast were “barely even friends, then someone bends unexpectedly.” For both Hermione and Belle, they were friends with Ron and Beast, respectively. Then, their relationships blossomed, ending their lives happily, after trying times and turmoil. Both ladies fell in love with the underdogs. Hermione could’ve easily married the Chosen One, Harry Potter, or the Quidditch superstar, Viktor Krum, but instead, fate directed her toward one of the Weasley boys. 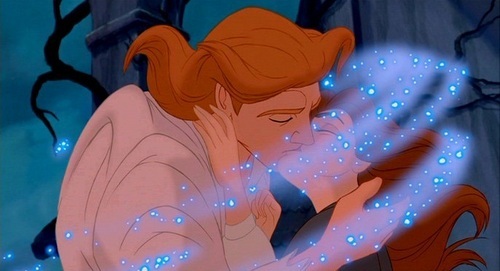 Belle could’ve married Gaston, but she fell in love with Beast, a fate that neither Belle nor the Beast expected. Are there any other major similarities between Hermione and Belle that aren’t listed here? Comment below!